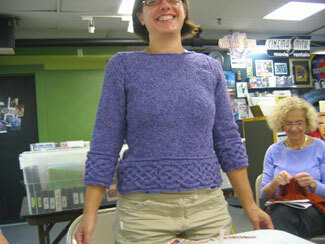 Emily showed up a couple of weeks ago in her beautiful Sand Dollar sweater from Nora Gaughn's Knitting Nature: 39 Designs Inspired by Patterns in Nature . 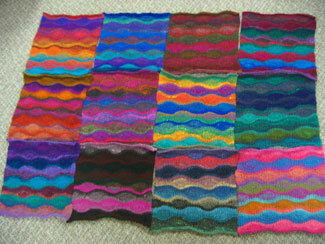 Emily has finished her amazing Lizard Ridge Afghan. Click for a bigger picture! Gorgeous!! Now we all want to make one! 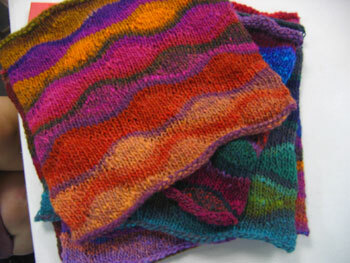 Emily's gorgeous Kureyon squares for her Lizard Ridge afghan. Wow! 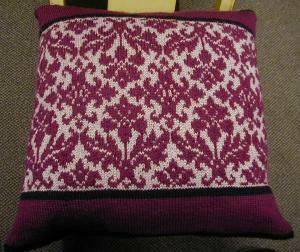 Emily's made a cool mitered square pillowcase. 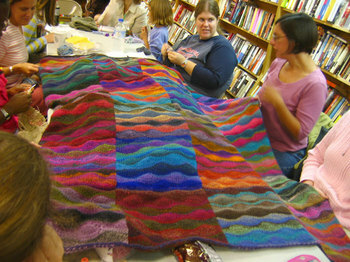 And since she hasn't stuffed it yet, she used it as a yarn rug for her in progress Noro project. 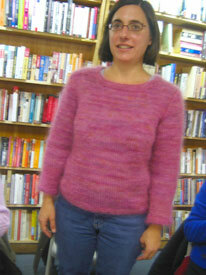 Emily's gorgeous sweater from Knitting Nature ! 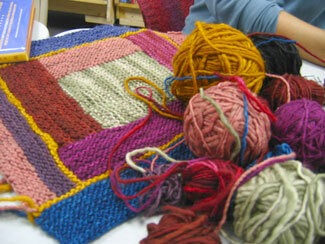 Emily (who has a little thing for Manos) is using her Manos leftovers to make a log cabin pillowcase. Ain't it gorgeous?! 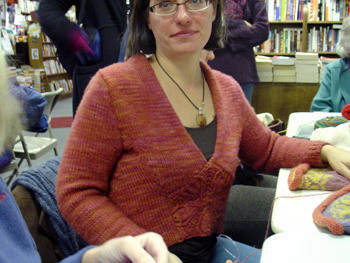 Emily was getting started on a sweater from Knitting Nature in an incredible silk/merino blend from Cherry Tree Hill. 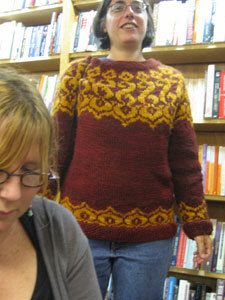 Emily finished her Kepler sweater (isn't that purple Jo Sharp Aran Tweed amazing?). I think it's the most flattering sweater she's ever made for herself. Don't you agree?! 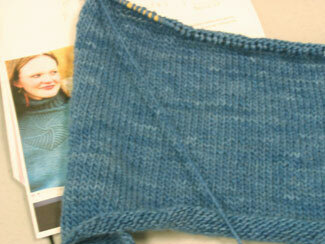 Emily is working on Kepler in the most beautiful color of Jo Sharp Silkroad Aran Tweed. Her pinky-red Malabrigo hat matches her sweater! 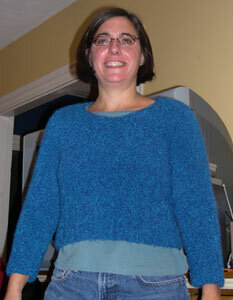 Emily finished her mohair pullover and it looks amazing on her! Emily in a fabby (and finished!) cropped pullover she got off the swap table. 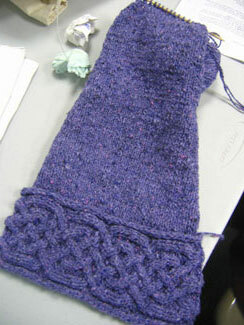 And here's the start to a sleeve for the lovely mohair sweater she's working on. 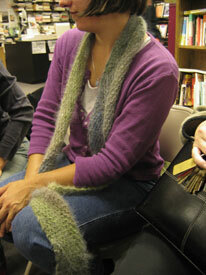 Emily came in this week wearing the prettiest multidirectional scarf I've ever seen. It gets skinnier around the neck, which gives it a long, elegant look. 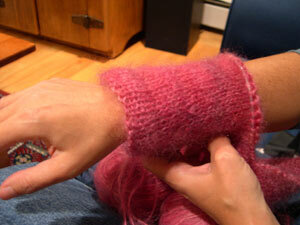 And I love the soft, fluffy yarn! 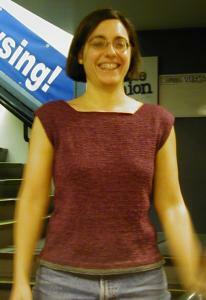 This week, Emily wore her amazing Moorish pullover (from Interweave Knits Winter 2003 in Manos. I love it when sweater season returns and we get to see everyone in their best sweaters, like this one from Emily, again. And even more socks! Just call us the Socksmiths. 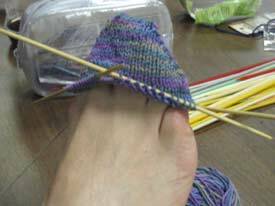 Emily finished her toe-up socks. 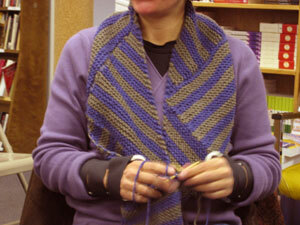 She's using the same yarn (Lorna's Laces Shepherd Sock, I believe) to make another pair. 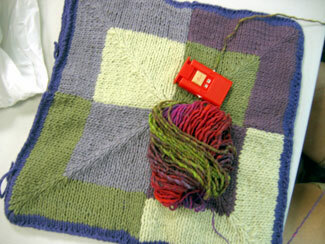 Emily's begun working on her Hannah Falkenberg shawl again. The colors are so nice together and the fine wool is lovely and light. 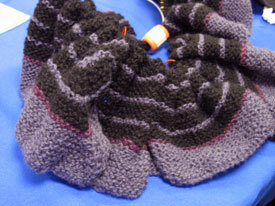 Emily's almost done with this neat multidirectional scarf for her nephew. He picked out the colors himself! Emily just finished this beautiful fitted shell for herself. Doesn't she look great! 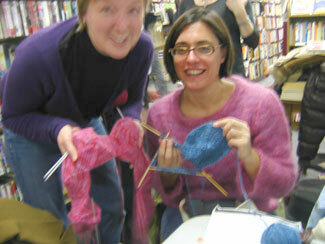 Emily has made so many beautiful things - sweaters, hats, afghans - but she's a bit camera shy. Today, she brought in this amazing Dale pillow that she just finished. Emily rules.